By Benjamin Mack. 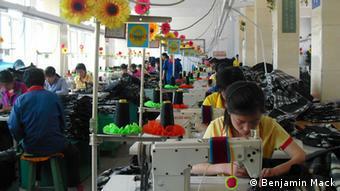 This article originally appeared on Deutsche Welle on July 26, 2013. Sixty years after the armistice that ended the Korean War, many changes have occurred in North Korea. But seeing them in this reclusive country, which has recently only just begun to promote tourism, is not easy. "The North Hamgyong Provincial E-Library has 301 computers," translates Suh Byung Kim, the wiry 34-year-old guide, as the head librarian speaks Korean. "It is open every day at 10 a.m. Every person in the provincial capital Chongjin can use them," he says to a group of Westerners visiting the location. However, the two-floor facility is already half-full - and it's only 9:00 a.m. "Many students come here before it opens," he explains. But Suh has no explanation as to why they're here on what is supposed to be a holiday. There are many computers in the building. They are all Dell models, only a few years old, boasting features such as Microsoft Office while running on a Windows XP operating system. But most striking is one particular feature: a desktop icon indicating an Internet Explorer browser. 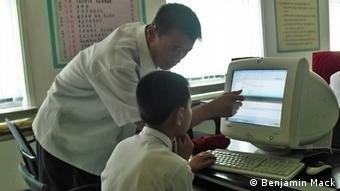 Could it be Internet access in North Korea? "I am sorry, but trying now is not possible," Suh says. "We must go quickly so not to disturb the students." Proliferating technology is one sign things are changing in the Democratic People's Republic of Korea - North Korea's official name - since an armistice ended the large-scale fighting of the Korean War 60 years ago. Considered less technologically developed than South Korea, more North Koreans are buying mobile phones, which are connected to either a nationwide 3G network called Koryolink or 2G operator SunNet but typically unable to make international calls. Smartphones such as Apple's iPhone can be purchased - as can their plethora of optional accessories. There's even a third-generation Android-based tablet available to North Korean consumers called "Samjiyon." The device comes installed with a version of the game "Angry Birds," a Korean-English dictionary, and features e-books praising the ruling Kim family and the government's communist system. It even has a web browser, but no Wi-Fi. But technological advancements have not changed the country's questionable human rights record, say experts. "I have seen no indication towards improving human rights in North Korea," says Greg Scarlatoiu, executive director of the US-based Committee for Human Rights in North Korea. "I am not optimistic." Scarlatoiu is not alone with his assessment. "Kim Jong Un's succession as North Korea's supreme leader after the death of his father, Kim Jong-Il, in December 2011 had little impact on the country's dire human rights record," writes Human Rights Watch in its 2013 World Report. "Arbitrary arrest, detention, lack of due process, torture and ill-treatment of detainees remain serious and pervasive problems." As is often the case, it is difficult to know with certainty how specifically the lives of ordinary North Koreans are changing. As Suh leads a small group through the city of Hoeryong - despite the distinction of this being the first group of Western tourists to visit the area - he and a pair of minders do their best to restrict photography. "Please, no photos of people without asking first," he reminds everyone. Later, Suh and the minders have no problems allowing pictures of spotlessly clean homes and smiling citizens in a model village along the coast near Nojok-tong. Such regulations may seem odd, but it's all part of the North's tourism policy, says Dr. Rajiv Narayan, a researcher with Amnesty International. "The reasoning is both financial and propaganda," says Narayan. "They only let you see what they want you to see. That will continue." The revenues are adding up thanks to increasing visitor numbers. Around 4,000 Westerners visited North Korea in 2012, a new record that the state-run Korean Central News Agency said was due to "eye-catching achievements made by the country in the effort for building a thriving socialist nation in recent years." Yet the increased tourism has been unable to mask another purported issue: food shortages. Narayan says the exact scope has been difficult to verify. "They have not been able to resolve the crisis and there is a health crisis as well, with access to basic health care difficult. Many of the health problems being reported are due to the food crisis." In the Rason Special Economic Zone, established in the early 1990s to promote economic growth through foreign investment and based on China's economic model, young women in high heels and Western fashions casually stroll past while checking messages on their phones. In a small photo studio next to the offices of the Rason International Tourist Agency, those with money to spend can purchase new batteries and memory cards for their digital cameras or, for three Chinese renminbi, have a photographer snap pictures of them standing in front of what's supposed to be the Pyongyang skyline. "As you can see," explains Kim Jaehyok, a 30-year-old guide with a steely expression, "Rason is a highly developed area. Citizens here enjoy a high standard of living." Conditions in the nearby Rajin Shoe Factory are somewhat different. Here, about 120 workers in four shifts produce around 180,000 pairs of women's and men's shoes to be sold domestically per year. "The workers are very busy and cannot be disturbed"
Revolutionary music glorifying the state blares from loudspeakers amid an acrid smell of hot glue. Surrounding the workers and their whirring machines are a myriad of propaganda posters inspiring them to work harder. Some are difficult to see from a distance due to the dim light. "It's not very bright in here," someone remarks. 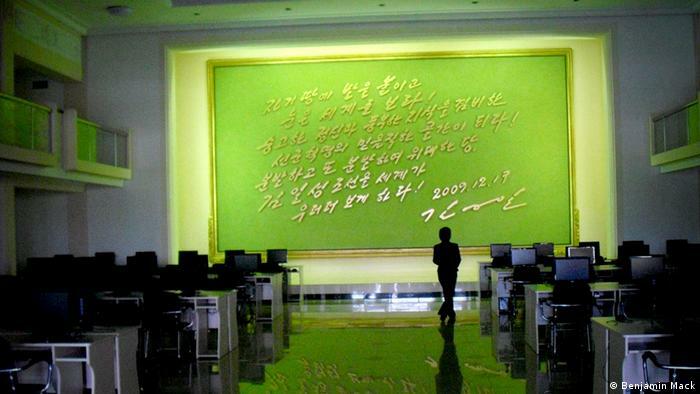 "In another building the workers have more light," Kim replies. We ask if we may go there. "I am sorry," Kim says. "The workers are very busy and cannot be disturbed." He pauses. "Now that we've seen the shoe factory, we will go for ice cream."